This article presents a detailed description and illustration of the skull of Liotyphlops albirostris in comparison to the skulls of Typhlophis squamosus, Leptotyphlops dulcis, and Typhlops jamaicensis, based on high-resolution X-ray computed tomography (HRXCT). The skull of T. squamosus is illustrated and discussed in detail for the first time. A number of uniquely shared derived characters is identified that support the monophyly of the clade Anomalepididae. Anomalepidids retain some features that are plesiomorphic relative to other scolecophidians, such as the presence of a supratemporal (except in Anomalepis) and ectopterygoid. The homology of the element located posteroventral to the eyeball in anomalepidids and variably referred to as a jugal or postorbital (or a fusion of both in Anomalepis) remains unknown. Scolecophidians exhibit a highly derived skull morphology adapted to head-first burrowing. Both anomalepidids and typhlopids evolved a condition known as an outer shell design, but did so in different ways. Leptotyphlopids combine elements of both the anomalepidid and typhlopid snout morphologies. This specimen was collected in Panama by C. Perez-Santos in 1982. It was made available for scanning by Dr. Jessie Maisano of The University of Texas at Austin and Mr. Alan Resetar of the Field Museum. Funding for scanning and image processing was provided by a National Science Foundation Assembling the Tree of Life grant (EF-0334961), The Deep Scaly Project: Resolving Squamate Phylogeny using Genomic and Morphological Approaches, to Drs. Jacques Gauthier of Yale University, Maureen Kearney of the Field Museum, Jessie Maisano of The University of Texas at Austin, Tod Reeder of San Diego State University, Olivier Rieppel of the Field Museum, Jack Sites of Brigham Young University, and John Wiens of SUNY Stonybrook. 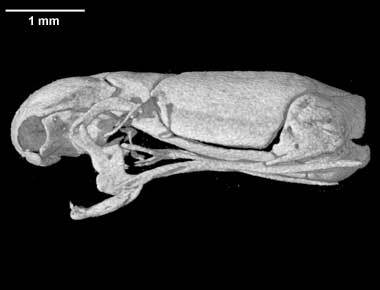 The specimen was scanned on a Skyscan 1172 microfocus X-ray CT scanner by Whitey Hagadorn at Amherst College. Each reconstructed slice represents a thickness and spacing of 0.00708 mm. Three-dimensional volumetric renderings of the skull with the jaw removed, and of the isolated left mandible. All are 2mb or less. To cite this page: Dr. Olivier Rieppel, N.J. Kley and J.A. Maisano, 2009, "Liotyphlops albirostris" (On-line), Digital Morphology. Accessed April 25, 2019 at http://digimorph.org/specimens/Liotyphlops_albirostris/.